LAWRENCE — Madison Sargent has always had an eye on the stars. Now she may achieve her goal of reaching out to them before she even graduates from college. Sargent, a junior in aerospace engineering at the University of Kansas, is leading an effort to put a tiny satellite from Kansas into space — part of NASA’s CubeSat Launch Initiative (CSLI) that launches small payloads beyond Earth’s atmosphere. She’s working with Marco Villa, a KU graduate who works in the satellite industry, to bring the project to fruition. If NASA approves the proposal, the Kansas-designed satellite could be launched to space in 2019, depending on launch availability. “Madison and the nano-satellite team are tackling one of the most complex tasks they will ever face,” said Villa, CEO of Tyvak International, an aerospace company based in Italy. He received his master’s degree in aerospace engineering from KU in 2002, followed by a doctorate in 2005. 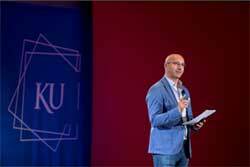 Villa knows whereof he speaks: While a student at KU, he led one of the university’s first efforts to launch a satellite under the CubeSat program, which launches “nano-satellites” from universities and other institutions around the country. Plans called for the satellite to be launched from Kazakhstan, aboard a Russian rocket. Now Sargent is leading the student team’s latest attempt. Her zest for space exploration has been readily apparent during her time at KU. She has served as president of the KU branch of the American Institute of Aeronautics and Astronautics, where she led a club trip to tour the facilities of SpaceX and Virgin Galactic. 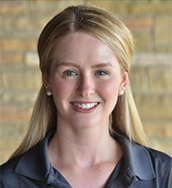 She has interned at Textron Aviation, Ball Aerospace and Barrett Aerospace, and she was also selected among 35 women for the 2017 inaugural class of Brooke Owens Fellows, a national program which seeks to "inspire and train exceptional undergraduate women seeking a career in aviation or space exploration." It was revisiting Villa’s earlier work, she said, that helped get the current effort underway. “I contacted Marco about a year ago or so,” Sargent said. “When he was here, he worked on CubeSats as part of his master's-Ph.D. thesis. He now runs Tyvak nanosatellites, so I think he wanted to reinvigorate what was here when he was here and give students the ability to do hands-on work." One other reason to pursue the project? Kansas is one of a dwindling number of states that has not launched a satellite under the NASA CSLI program. “It is absolutely unbearable to be one of the few states in the U.S. and in the world that does not have a satellite in space,” Villa said. In the future, he said, “Kansas will discover that many more of its indigenous industries will be able to reap the benefits by leveraging on space assets” — say, by measuring crops more precisely or predicting when farm acreage is undergoing stressful conditions that could result in crop failure. It’s a big project, but the proposed satellites are small. According to NASA, CubeSats are built in units of 10-by-10-by-11 centimeters — payloads can be up to six units in size, which would weigh about 26.5 pounds. The KU group lead by Sargent proposed a six-unit-sized payload to carry four different instruments: a cosmic ray detector; a device to measure ice sheet thickness at the South Pole, and an “astrobiology collaboration” with KU biologists that would carry bacteria and fungi for further study in partnership with K-12 students. A fourth instrument, an “energetic particle detector,” is sponsored by Fundamental Technologies, a Lawrence-based company that works on space-related projects. For her part, Sargent said she’s benefited from being at KU. The aerospace engineering program is largely oriented toward in-atmosphere aircraft design, she noted, but the program has offered plenty of support — in terms of resources and funding — as she has taken the initiative on more space-related projects. “Projects like this, being able to connect with alumni like Marco who will donate their time and even say, ‘My company will donate a system as long as we know that you're serious about this, and that you know everyone is onboard.’ That's really big, and I don't think that that would necessarily be the case everywhere,” Sargent said. Villa, meanwhile, sees his involvement as a form of paying back the benefits he received from his own KU experience. First thing’s first, though: Getting a CubeSat into space. NASA is expected to select the latest round of CubeSat participants by Friday, Feb. 16.